Do you have a reduced price for upgrading to the Corel Painter 2018 version, that is now being sold by Corel for $269.00. Special reduced pricing will be offered by Corel later today or first thing in the morning. Keep a look out. Most folks will be notified by email I believe. Yay! Thank you for keeping us in touch on that one Skip! I signed up for your class and then .. uh oh .. i did not see the special price. Whew! I have heard $129.00 and $99.00, but I don’t know which one is correct…maybe both. Please look at the comments above. Several folks have called the number that John provided and gotten a special price. I haven’t not tried it myself. That seems to be for Painter 2017. Is there a special price for Painter 2018? I think this price may last about a week. I hadn’t heard about the $99.00 price, yet. I only knew about the $129.00 price. I hope folks see this. Thank you so much for sharing this, John! Thanks, John. Corel should not make us work so hard to get the $99 price. I appreciate your sharing this. It works! Hi Skip… Hi everyone… just used this phone number and received the upgrade for $99… quick and easy! Thanks John…good to know that it is still working. Oh, Skip, you’re a big tease. I totally was not going to update because due to remodeling my house, I never got through all of what was in 2017. But this sounds very tempting. Will I like this for my abstract art? It really sounds like it. Plus, I think i will like it even better than 2017 for photos. I’m going to try the free trial. Will I have a lot of problems if I don’t know 2017 all that well? I understand the basics of textures. I understand the glazing brushes, but I’m not sure I 100% understand dab stencils. I keep playing with them. You will be fine. I think you will love the thick paint…especially palette knives…they do work very well. Do get the free trial and see how it works for yourself. Thanks Skip. I will probably update because I just got the limited time offer of $129. Or I could wait until December like I did with 2017. When does class start at DAA? Class starts July 8th. Hope to see you there. BTW…look at the comment above yours from John. He gives a number to call to get the $99.00 discount…like last year. Thanks so much Skip. I’m watching the webinar. I’m getting very excited!!!!! Actually I called that number but they only offered the 129. I took that. Prices go up…that’s life. I look forward to your next class Skip. It may have been a mistake when John called. I was surprised because I thought it was 129.00 US. Oh well…it was good while it lasted. Thanks for the update Michael. Painter 2018 sounds like a useful upgrade …. Unfortunately, the download link that you supplied for the PC trial software is only ver 2017 (the Mac ver is 2018). Please do you have an alternative link for the PC version ??? Hi Brian, the link should have given you an option. It may not have been up at the time I posted…I don’t know. Try this one, but if it is only for the Mac…just google Painter 2018 and you will probably get to the right place. Painter 2018. I just must sign up for this but it won’t be right away, budget restraints have to allow for it, but you class is too much fun to miss! I think Corel needs to get its story straight. That’s not what they told me. This is crazy. So what are people supposed to do who bought the $99 version? Once again just say we’ve been screwed by Corel? Gosh I’m tired of this. Thanks, Skip! I see the response below. What a mish mash mess. Well, I guess Iucked out! I’ll just proceed with a smile. Thanks for helping us out with Corel. I really appreciate your help. We need it. See you in class. I’m really looking forward to it. I’m frantically finishing a painting in 2017. That’s nice… the gentleman at Corel didn’t bother to mention that when I ordered. Skip, are we able to upgrade to future versions with this $99 version or is this the end of the line? I agree with Kerry Mitchell, Corel shouldn’t be so sneaky. 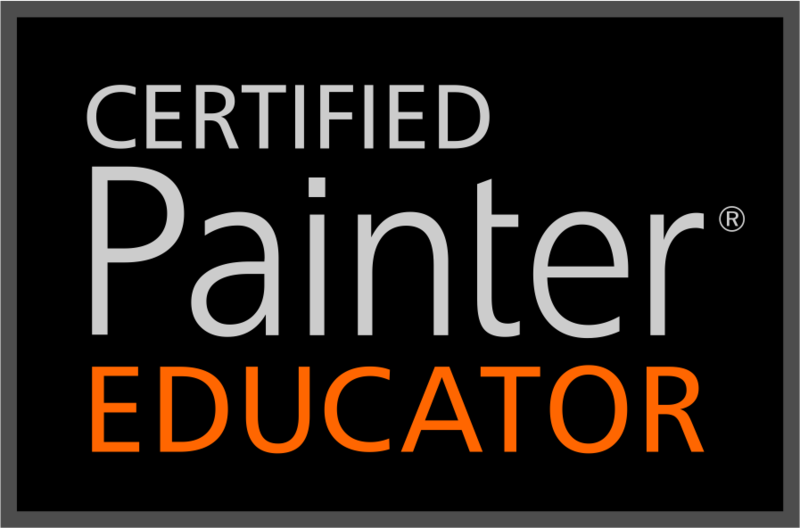 There are many other painting software out there today that are able to do the same that Painter does, for far less. I’m using other software now and am very happy. So, if my “education” version is unable to upgrade to the next version when it becomes available, Corel has lost a customer! Hey…My mistake. I misunderstood Tanya. She said that your purchase is for the regular version and will be fully supported as such. The education version is priced at $99, but requires proof you are a student. The offer for a discount of $129. is still in effect, but the $99 discount that your got has been shut down…it wasn’t authorized. So, you guys were lucky. But all is good, now. So sorry for the confusion on my part. I love Rebelle. I use it for drips. I can’t get Painter to make drips like Rebelle can. The two are very different. I like Rebelle for very certain type of watercolor painting and Painter for other watercolor painting. The big thing about the Rebelle 2 update was the ability to save in Photoshop format psd so one can easily move from Painter to Rebelle to Photoshop, etc. Plus, it is more robust. Hi Kerry… I agree. As soon as I saw what it could do, I bought it. I don’t have anything else in my war chest that comes close to traditional watercolors like Rebelle. I’m curious if the information on how to get flow maps for express painting will be available somewhere again. I can’t find any info from the old seminar anywhere and I just upgraded from P12 to 18. I read the comments from the youtube sample, but maybe the terminology for the folders is different now. Can’t seem to find the painteffects folder. I’m plenty comfortable messing around in my OS, so I wanted to give it a try. Hi Aaron, I explained how to do that in the class, Painter 2017, Woo Hoo at the digital art academy. I haven’t posted those videos anywhere else, but I did explain some on the You Tube videos you found. The terminology hasn’t changed, everything is still the same for making express paint utilize flow maps. Right now I’m slammed getting the new class ready for Painter 2018. After that is finished, I may have time to demonstrate the technique…but I am not promising. 🙂 My life has been sort of hectic this last year. Hey Skip, Thanks for the reply. I found the folder. Thanks again for your site, info and classes. I still use several of your first brushes (and new ones) still to this day. Hi Jesus, I am sorry for the late reply. I do not have a tutorial for this painting, but I hope to have some tutorials up in a few weeks. Right now all my energy is focused on the class. After that is complete, I’ll try and do a few tutorials using thick paint. Help! I already have 2016. I downloaded the trial version of 2017 and decided to buy 2018. But the upgrade version 2018 will not download. Do I need to delete 2017 first? Thanks! Hi Rod, I am so sorry for the delay in replying. I hope your issue has been resolved. I wouldn’t think having the trial version of 2017 on your computer would stop the download of 2018, but I do not know. This is probably best answered by Corel Tech Support. If you still haven’t resolved your issue, please feel free to write back and give me more details and I’ll see if I can help. I need to know exactly what is happening when you try to download, what operating system you are using, and what browser. Again, sorry for the delay in replying. Skip, I saw your painting for the P2018 promo and thought it looked so luscious I had to have it. Tell you what,…if it was any more “realistic” it would have to smell like turps! Been out of the loop for a bit…okay, a couple of years, but I thought of you all often! wish me luck getting back into the swing of things. Any books coming out? Other crutches for we us, who prefer to curl up with a good read? Is it to late to get the class on thick paint? The gravid matter about the Rebelle 2 update was the power to save in Photoshop data format psd so one can easily relocation from painter to Rebelle to Photoshop, etc. I just desire to know if you throw a tutorial of this beautiful heyday painting that you did with the raw compact paint brushwood from Corel painter 2018, and if not, another tutorial working with compact paint. I am sorry, but I do not have a tutorial currently for thick paint. I hope to get one done soon. Thanks for asking. Hi, Skip. If I sign up for the 2018 course, how long will the course be available to me over the next year?